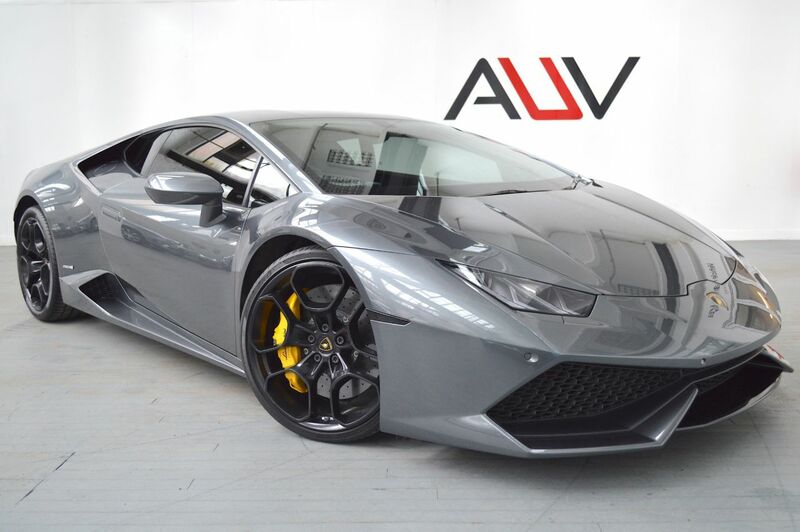 We are delighted to have in the showroom this truly stunning 2015/15 Lamborghini Huracan LP610-4 finished in Grigio Lynx over Nero Ade., Registered on the 6th of August 2015 with full Lamborghini service record last carried out in August 2018 at 6616 miles with a remaining manufacturers warranty to August 2019. Options include 20 inch Giano alloy wheels finished in black, Lifting System & Magneto-Rheologic Suspension, Transparent Engine Bonnet with Carbon Forged Engine Bay, Lamborghini Dynamic Steering (LDS), Electric & Heated Seats, Navigation System, Rear Parking Camera, Front & Rear Parking Sensors, Bluetooth Preparation, DAB Digital Radio, Branding Package, Optional Stitching, Floor Mats with Leather Piping & Double Stitching, CCB with Yellow Calipers. Standard factory options are Auto Headlights, Carbon Ceramic Brakes, Dual-Zone Air Conditioning, Multimedia Interface with iPod/iPhone Connection, Keyless Entry, Lamborghini Infotainment System, Push Button Start, Power Windows, Sports Seats, Traction Control, Tyre Pressure Monitoring, Mirrors External - Electrically Operated, Heated and Foldable, 12.3in TFT Instrument Panel, Contoured Sports Seats, Controls Integrated in the Steering Wheel, ABS, Drivers Airbag, Electro-Mechanical Assisted Power Steering, Electronic Stability Control, Full-LED Lighting System, Head Restraints - Front, Immobiliser, Passengers Airbag, Rear Mechanical Self-Locking Differential, TCS, Third Brake Light, Rear Fixed Spoiler Integrated in the Body Shape, Side Airbags, Air conditioning, Airbags, Alarm, Alloy wheels, CD Player, Central locking, Cruise control, Electric door mirrors, Electric windows, Parking aid, Power steering, Radio, Remote central locking, Satellite navigation, Sports seats, Traction control Before you reserve a vehicle we ask that you read both our Business and Warranty conditions in the 'Terms' tab above. Specialists in vehicle financing we can offer our clients market leading, bespoke funding packages. Finance examples are subject to status, regulated and monitored by the FCA. Goods and services are supplied by Approved Used Vehicles Ltd. For further information on how to reserve this vehicle or tailor your finance package please call us on 01455 446505.